El Nido, Palawan – Cebuana Lhuillier through its CSR arm Cebuana Lhuillier Foundation, Inc. (CLFI) continues to give Alternative Learning System (ALS) learners a better chance for a better life by launching its’ 77th DepEd-Cebuana Lhuillier ALS Community Learning Center (CLC) in El Nido Central School last October 1, 2018. Present in the launching event were Palawan Mayor Nieves Cabunalda-Rosento, Vice Mayor Leonor Coral, Mr. Servillano A. Arzaga, Schools Division Superintendent, Ms. Lutgarda S. Juanich, Public Schools District Supervisor, and Ms. Sylvia Decolongon; Principal of El Nido Central School. Mr. Jonathan D. Batangan, CLFI Executive Director, shared that CLFI believes in the saying “And Edukasyon ay hindi lamang pribelehiyo, kung hindi ito ay isang ring karapatan” (“Education is not a privilege, Education is a right”). CLFI believes that Education is an indispensable tool for poverty alleviation and should provide equal access to all. Mr. Batangan hopes that CLFI may be an inspiration to other private institution and companies, so more ALS Centers will be built, more ALS Teachers will be recognized, and more ALS Learners will have opportunities to uplift their economic condition helping them to become progressive individuals in the community. CLFI Education and Special Projects Head, Kristina Muñiz, Assistant to the President and CEO Raffy Ladao and Area 110 Technical Assistant Charito Carolino were also present. Hon. 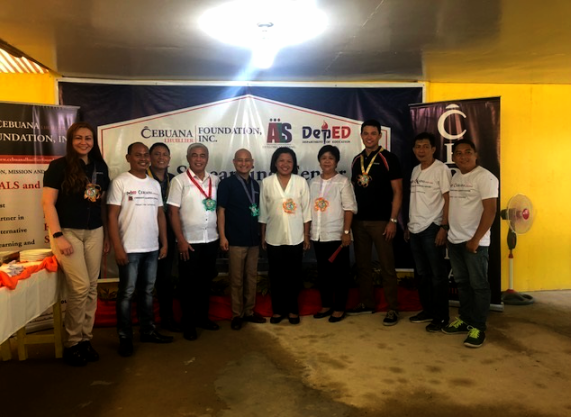 Nieves Cabunalda-Rosento, Mayor of El Nido, Palawan, thanked CLFI for choosing El Nido Central School as its 77th DepEd-Cebuana ALS CLC nationwide.